Students at the University of Toronto. Photo by Janine Riviere from the Torontoist Flickr Pool. During my first year at Ryerson University, I lived in residence. I was lucky to get in—because the school has just three res buildings, with a total of 850 rooms, only the students who live farthest from campus are accepted. I hailed from Hamilton, an hour away from the city, and managed to snag a spot. I went to frosh-week pub nights and got a part-time job at the campus bookstore, and, after my first year, moved into an affordable apartment five minutes from school. I could have lived at home and commuted, but I knew I’d miss out on what I felt were important elements of student life. Over the next three years, I joined my program’s course union, stayed late on campus for group projects, and went to rallies and panel discussions. My proximity to campus made participation in these things easy. This isn’t the reality for many Toronto students. According to a new report [PDF], students are spending too much time getting to and from school. StudentMoveTO analyzed commuting patterns at four post-secondary institutions—Ryerson, York University, University of Toronto, and OCAD University—and found that one-third of survey respondents spend two hours or more getting to class every day. The worrying consequence, the study found, is that students are choosing courses based on which days of the week they’re offered, stacking their schedules so they can make one fewer trip to campus each week. Commuter students are also less likely to get involved with extra-curricular activities, the data shows. “Students may be grouping courses together or avoiding early mornings and late nights, but while these behaviours reduce the burden of travel, they are not ideal from an academic perspective,” the report states. StudentMoveTO is a collaboration between Toronto’s four universities. Last September, researchers sent out a voluntary survey via email to the schools’ 185,000 students. More than 15,000 responded, recording all of their travel in a 24-hour period—be it bussing to school, biking to work, or walking to the gym. It provided a snapshot of students’ transportation patterns, as well as their lives, packed full of schoolwork, jobs, and spending time with their families. While the main finding seems obvious—that students spend way too much time crammed into subways or stuck in traffic—the survey provides the largest data sample yet of students’ commuting patterns. Until now, commuting horror stories have been just that: anecdotal stories. Having hard numbers that prove students are indeed dealing with prolonged commutes is a beneficial thing, says Matti Siemiatycki, one of StudentMoveTO’s lead researchers and a geography professor at U of T.
Most students—63 per cent—rely on public transit, while 26 per cent walk or bike. The most common reason for why they live where they do? Unsurprisingly, the cost of housing. The survey found that, on any given day, a student who lives farther from school is less likely to attend than one who lives nearby. When I lived on the edge of Ryerson’s campus, I went to all my classes, even what I felt were, in hindsight, pretty pointless one-hour English and politics tutorials. They were easy to attend. 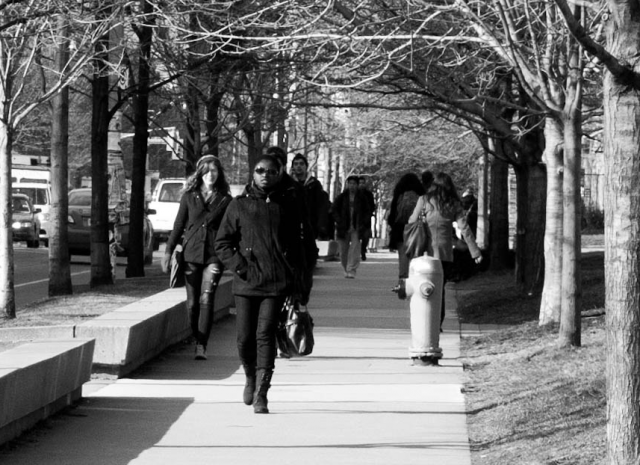 The commuter effect is detrimental both to the students themselves and to universities’ vibrancy and diversity. But how, when transportation is such a barrier? The researchers are reaching out to Metrolinx, the TTC, and the City of Toronto to discuss StudentMoveTO’s findings, Siemiatycki says. While York will benefit from the new subway line stretching from Downsview Station, schools don’t have the funds or authority to construct public transit routes across the city. But there are ways universities can cater to their commuters, such as re-evaluating how they schedule courses, or opening a hostel so students have a place to crash when they stay late on campus, as Ryerson has done. Other options are improving parking on campus, or creating a commuter lounge, with microwaves, where students can eat and study between classes. Siemiatycki, who spends 20 minutes commuting to work on his bike, says for the “significant share” of respondents who walk or cycle, schools could improve pedestrian safety on campus, and add bike lockers and shower facilities. For years, U of T’s Transportation Tomorrow Survey has collected data about travel patterns across the GTA. But it’s not student-specific—in fact, because it relies on a telephone-survey model, young people aren’t well-represented, says Siemiatycki. Yet that’s the data planners and politicians use to make decisions about transit. He sees the StudentMoveTO report as a complement to Transportation Tomorrow—a way to ensure students’ experiences are recognized and, ideally, reflected in the city’s future transportation planning. The StudentMoveTO report is publicly available here.